Bring In the Bling This Week! Mid February, time for a bit of bling, don’t you think? Can you bring a bit of bling into your life this week? Last night I was sewing sequins. (I love how that sounds!) Yes, last night I was sewing sequins! 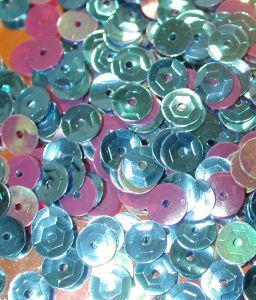 Don’t panic, I’ve not taken up ballroom dancing and am now sewing 1000s of sequins onto my ball gown (although that is an idea…). I was sewing them onto something I’d made that I decided just needed a tiny lift. The item was perfectly fine as it was but that tiny bit of bling lifted it into something else. The addition of a few sequins cast light where needed and made something ordinary just a little bit more special. It only added about an hour to the overall time of the project but made a big difference. And that set me to thinking about the coming week. Without really considering it too much, we’ll all probably work reasonably hard and get perfectly reasonable results. A fairly ordinary week. But if you wanted to lift this week out of the ordinary, if you wanted to scatter a few sequins around, add some bling to your week, cast light to show case you or your work, what would that mean for you? Would it be rising to a challenge? Making a new friend? Sticking your head above the parapet on a work issue? Signing up for a course? Wearing brighter clothes? Taking a risk in your personal life? Then imagine yourself doing it. Then imagine how you might feel after you’ve done it. What are your added sequins for this week? I’d love to know if you’re happy to share! You make me smile, Jane. I am always up for a new challenge. I find that when I get stuck in a rut, I am least likely to accomplish much. I will consider your challenge and actually, I already have a fairly big bling to get me going! Jane, what a great blog! And yes, I’ve decided that I will indeed have sequins this week! Thanks Ed & Julie. Nice to have some comments from the star spangled U.S!